Temperature reconstruction of Greenland shows ups and downs in climate happened over 5600 years | Watts Up With That? Greenland’s early Viking settlers were subjected to rapidly changing climate. Temperatures plunged several degrees in a span of decades, according to research from Brown University. A reconstruction of 5,600 years of climate history from lakes near the Norse settlement in western Greenland also shows how climate affected the Dorset and Saqqaq cultures. Results appear in Proceedings of the National Academy of Sciences. PROVIDENCE, R.I. [from Brown University] — The end of the Norse settlements on Greenland likely will remain shrouded in mystery. While there is scant written evidence of the colony’s demise in the 14th and early 15th centuries, archaeological remains can fill some of the blanks, but not all. The Brown scientists’ finding comes from the first reconstruction of 5,600 years of climate history from two lakes in Kangerlussuaq, near the Norse “Western Settlement.” Unlike ice cores taken from the Greenland ice sheet hundreds of miles inland, the new lake core measurements reflect air temperatures where the Vikings lived, as well as those experienced by the Saqqaq and the Dorset, Stone Age cultures that preceded them. D’Andrea points out that climate is not the only factor in the demise of the Norse Western Settlement. The Vikings’ sedentary lifestyle, reliance on agriculture and livestock for food, dependence on trade with Scandinavia and combative relations with the neighboring Inuit, are believed to be contributing factors. Still, it appears that climate played a significant role. The Vikings arrived in Greenland in the 980s, establishing a string of small communities along Greenland’s west coast. (Another grouping of communities, called the “Eastern Settlement” also was located on the west coast but farther south on the island.) The arrival coincided with a time of relatively mild weather, similar to that in Greenland today. However, beginning around 1100, the climate began an 80-year period in which temperatures dropped 4 degrees Celsius (7 degrees Fahrenheit), the Brown scientists concluded from the lake readings. While that may not be considered precipitous, especially in the summer, the change could have ushered in a number of hazards, including shorter crop-growing seasons, less available food for livestock and more sea ice that may have blocked trade. “You have an interval when the summers are long and balmy and you build up the size of your farm, and then suddenly year after year, you go into this cooling trend, and the summers are getting shorter and colder and you can’t make as much hay. You can imagine how that particular lifestyle may not be able to make it,” D’Andrea said. Archaeological and written records show the Western Settlement persisted until sometime around the mid-1300s. The Eastern Settlement is believed to have vanished in the first two decades of the 1400s. The Saqqaq exit coincides with the arrival of the Dorset people, who were more accustomed to hunting from the sea ice that would have accumulated with the colder climate at the time. Yet by around 50 B.C., the Dorset culture was waning in western Greenland, despite its affinity for cold weather. “It is possible that it got so cold they left, but there has to be more to it than that,” D’Andrea said. Contributing authors include Sherilyn Fritz from the University of Nebraska–Lincoln and N. John Anderson from Loughborough University in the United Kingdom. The National Science Foundation funded the work. my reading of this when i read it in the newspaper was that they were trying to stress that climate can change suddenly, as shown in this study, and therefore the unspoken part is that we must do something now to avoid another sudden change. Or am I just so used to this now that I read more into it than was intended. But nowhere did they mention the elephant in the room…. Climate changed suddenly then… Was it the Vikings or the Inuit that caused it with their 15th century 4x 4 cars? I’m positive that he didn’t mean to…..
…but he just said it’s business as usual. Nothing new and that temperatures can fall faster than they can rise. That the planet wants to be cold, not warm. Do we have to beat them up to see their temperature reconstruction? Seems to be noticable lack of mention of how it got so warm back then…and an interesting mention of climate change while failing to emphasize in which direction the change progressed. that’ll be the Great Unknown Eruption of 1258 AD, signalled in the Greenland ice cores, one of the biggest in the Holocene. (Oppenheimer 2003; INTERNATIONAL JOURNAL OF CLIMATOLOGY; Int. J. Climatol. It’s either the sun or Mother Earth. Move along, nothing to see here…..
Is there a link to their reconstruction? Sounds like an analysis of the past few years in the lives of Saskatchewan farmers. They just had to put that in didn’t they. What RAPID change? The slight cooling going on now? Which “rapid changes taking place today” is the author alluding to? No graph for the reconstruction? Still interesting. This could mean that the current melting of the Greenland ice is a recovery from LIA, i.e a return to “normal”. the area inhabited by the norse, where they had large farms, livestock, churches could support quite large communities at the time, where today it would be impossible, suggests that at least on Greenland it must have been much warmer than today. I just find it astounding but not surprising that Reuters felt compelled to take an article that shows clearly the climate goes up and down without man’s CO2 influence and spin it the AGW way. They wouldn’t be activists if they could. 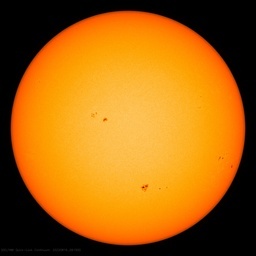 Is there a source for sunspot cycles for these years? And other lake/ocean sediment data covering the years in this paper? I remember screaming at some idiot reporter on TV recently when I was being shown some port on the coast of Greenland which was apparently ice-free for the first time ever! It of course didn’t occur to the idiot reporter to wonder why a port, with landings and jetties and stuff, had been built in the first place if it was permanently frozen. CONCLUSION… the climate changes, regardless of the CO2 concentration. We better stop depending on agriculture and livestock for food then. I can’t imagine the Vikings’ leading a sedentary lifestyle. What did they do, sit around playing Viking Hero on the PS3? Please guys, follow the narrative. This article proves that ‘the climate’ can shift around suddenly, like luggage in the overhead bin. The greenhouse theory proves that we are taking off in the plane. Between us and with a few more analogies like how vaccines are like nectar, how global warming is like living in a roach motel and other highway driving metaphors like ‘pedal to the metal’ and bathroom metaphors like the ‘filling bathtub of liquid nitrogen in the sea of dry ice’, I’m sure we can completely understand the climate system. By the way, you might read this comment and think I’m drinking, but I am not. So… we have evidence that warming enabled growth of human range and habitation, and sudden cooling catastrophically (locally) reduced it. We also have record of a .5C/decade temperature change without anthropogenic forcings. Isn’t this a bit counter to the “narrative”? Bonus points for asking the question of ….Why? Climate changes, land rises and falls, but no one seems to ask why ports are built where they are. A lot of ports built early are landlocked, a lot of them are now underwater. They wern’t that way when they were built! If Greenland had been inhabited when it was colder, it would have been named “Whiteland”. Do any of these AGW alarmist get how stupid their statements about Greenland are? If the reconstruction follows the pattern of the ice-sheet cores, temperature at the present will be lower than it was 5600 years ago, even though CO2 concentration is much higher. I am with batheswithwhales (see his post May 31, 2011 at 10:04 am). I consider that they very much underestimate how much warmer Greenland must have been than it is today for farming with primative means to have flourished for three or four hundred years. I disagree with the article’s statement, “The arrival coincided with a time of relatively mild weather, similar to that in Greenland today.” The best evidence shows they arrived when the world climate (as measured by sea levels) was warmer by about a 0.6m higher sea level than now at the tail end of the Medieval Warm Period (MWP). Interestingly, the conditions during which the Norse settled Greenland was right about what the IPCC’s worst case scenario anticipates. Brattahild was established around ca 985 and Leif Eriksson’s explored farther west ca 1000. Referring to the Late Holocene sea level data from Fairbridge (1976), the Norse settled Iceland just following a climate optimum during the MWP. ( The optimum enjoyed a sea level about 1.3m higher than now.) In the cooling trend following the optimum, things weren’t so rosy in Iceland and Erik the Red got into trouble, leading him to look for other options. So, he headed farther west on the rumors of new lands. It was not until 1300 that the conditions of Greenland (and Newfoundland, for that matter) cool to the point of being similar to conditions today. At that point, the Norse western settlements fell into oblivion at the front end of the Little Ice Age. Author David Keys was involved in a documentary aired on PBS a while back about the subject. The Archeologists used Entomology to track the cooling trend. Their conclusions coincided closely with the sea level data. Somewhere I recall reading an historical account of the weather in Europe around the turn of the previous millenium (1000 A.D.) – – people were swimming in the Rhine during winter months. Does anyone have a source for this, or is my memory playing tricks? Yet a 2C warming is considered the end of Earth as we know it…. Not really! There is actually an abundance of specific information about the people (names, identity of farms in East Settlement and West Settlement, successful and unsuccessful farming techniques, churchgoing, etc. ) derived both from previous archaeological digs and from written records. The Vatican retains a lot of specific information from the many (mostly not very happy) Greenland bishops it sent there over several hundred years for example. An excellent summary of this appears in Jared Diamond’s interesting book “Collapse: how societies choose to fail or succeed” (2005, Penguin Books). Readers of that book may not be so thrilled with the warmist viewpoints expressed by Diamond in examination of other societies’ rise and fall. Much of this information has been readily available for many years, and would seem to provide ample evidence for the existence (and plenty of crop evidence for the approximate summer temperatures) of the Medieval Warm Period in Greenland. There are also UK and other MWP period castles with ports etc. now located up to a mile or more inland, from which we can reasonably deduce the water was rather deeper than now. Observing the obvious is difficult, but rewarding. Slide 20 of http://www.leif.org/research/Does%20The%20Sun%20Vary%20Enough.pdf gives 10Be and 14C records for the past 2000 years. They discussed how the different Canadian arctic cultures moved settlements, switched from caribou-muskox to marine mammal hunting and how the arctic and that climate varied over the past 4 thousands years where sea ice lasted 2 months longer as well as 2 months shorter than today with similar accompanying temperature trends. Because warm inflows from both the Atlantic and Pacific are saltier and denser, that warm water lays below a much colder and fresher surface water. Changes in winds and can alter ice cover and bring that warm water to the surface as observed in the polynya that remain ice free most of the winter despite the -25 winter temperatures. Studies of the Dansgaard-Oesger events during the ice age show rapid 5-10 degrees alterations over periods of decades or less and most believe it is a function warmer waters being either insulated or brought to the surface. Those rapid changes have been less dramatic the past 10,000 years as the Bering Strait has opened and allowed greater mixing of arctic waters. However the dynamic is still in play, as demonstrated when the arctic warmed during the 30’s and 40’s just as it has done recently. Even more recently the “Great Salinity Anomaly” of the 70’s brought cold freshwater from the Arctic into the north Atlantic where it was tracked for 15 years as it brought colder temperatures to Europe. The GISP2 record shows we are in a cooling trend punctuated by warm episodes. Treeline was much further north from 9000 -3000 years ago. Measurements over the south pole and over north pole ice also show decreasing temperatures these past 50 years while the warming episodes are associated with places where sea ice has been blown away and warm water brought to the surface such as over the Barents Sea. Read Rigor 2004 “Variations in the age of Arctic sea-ice and summer sea-ice extent” available at http://iabp.apl.washington.edu/pdfs/RigorWallace2004.pdf they modeled how the change in ice is driven all by winds and ocean inflows. The following statement “…It is interesting to consider how rapid climate change may have impacted past societies, particularly in light of the rapid changes taking place today…” is used to feed the CAGW masses. They saw a 7 degree drop in 80 years, compared to our 1 degree rise over the past 150 years. Which one was more rapid? And, while they may not have had 4×4 chariots, they did have cattle. Methane is more powerful than CO2, right? It hasn’t shown up on the NOAA Paleoclimatological website. I would think, if there was NOAA money involved, it should show up eventually. Arctic Circle is unique in its response to the solar output. Many respected scientists claim that direct solar input doesn’t change sufficiently to explain change from the MWP to LIA and back to the current warming period, so I am happy to accept their findings. However, that is not where solar story ends as it is graphically shown here. The Dorset were extremely cold-adapted. While they might have disappeared in Greenland in the first century BC, they continued in far Northern continental North America until about the time of the medieval warm period. This was when the Thule invaded their traditional space and apparently drove them out. The Thule had boats and bow and arrow, the Dorset had only the spear which they used to spear seals surfacing for air from their holes on the ice. Apparently the Dorset were also fairly docile. When the Thule would raid their settlements, the Dorset apparently would run away rather than fight and were often chased out into the wilderness from their settlements. The Dorset were much taller than the Thule but apparently not combative. They were not warriors. The warming of the medieval warm period apparently caused a great loss of their range in walking over sea ice to hunt seals and allowed populations using boats to invade their territory. The Dorset were pretty much gone by the 16th century but possibly held on in isolated islands until the early 20th century. I am not aware of any genetic studies done on the Dorset people but would be fascinated by one if it exists. Apparently there was no interbreeding with the Thule Inuit so it might be that the Dorset were just too “different”. I have often wondered if the Dorset might be truly the last of the Neanderthal line. An even more cold-adapted, taller version on the Neanderthal. Professor Huang is not a “climate scientist” so how can we can believe anything he says? Except we’re talking about the BCs here. Is there any data that goes back that far, or are we only able to go back 2k years? If the climate changed quickly in those days then it had to be due to natural causes. Greenland is relatively warm just now, but no warmer than it has been during other periods in the 20th century. Sea ice-hunting has been replaced with fishing AGAIN. See reply# 7 on the thread that is linked to my name. The names of the pre-Inuit people have varied names depending on the authors. McGhee refers to the paleo-eskimos as Tuniit and they have been connected to Siberian cultures and the Saami who were caribou(reindeer) and musk ox hunters. They mostly used wood fires and all were connected by use of fine tools for making very detailed figurines. The Dorset culture is believed to be an evolution of the early Tuniit to a more marine mammal based culture that began using stone whale oil lamps instead of wood. The Inuits are related to the Aleuts and the Bering Sea whaling cultures. The Inuits have a oral history about displacing a more peaceful Tuniit. The last known Tuniit people live on South Hampton Island at the top of the Hudson Bay. Genetics were done on that population and they were apparently hybrid Tuniit and Inuit. They were all extirpated by disease when a Scottish whaling ship brought sick sailors to the island. The new consensus has been that although the warming period made it easier for the Inuit to transit to eastern Canada, it was trade in iron goods with the Norse and Tuniit that attracted them. The Tuniit had access to copper and metorite iron for tool making that was highly valued by the Bering Sea whaling cultures. The Greenland Norse with their iron goods were also very dependent on trade with Europe. A combination of the little Ice Age and the breakdown in trade caused both Norse and Inuits to abandon most of the far northern settlements. However in the 1950’s the Canadian government used long abandoned archaeological sites of both Tiniit and Inuiit when they deceptively re-located Inuits in order to establish land claims against the US for certain parts of the Arctic. Ironically it was many of the people in the documentary Nanook of the North that were re-located. The Canadians just made reparations a few years ago for their deception. So living conditions deteriorate when temperatures drop. So what is all the fuss about a small temperature increase which thankfully ended the little ice age. If a temperature drop of 4C finished off the Vikings in Greenland, there must have been a corresponding increase of 4C to kickstart the settlement of Greenland. There is no evidence that this was caused by CO2 or that the decrease was caused by falling CO2 levels. It is also a lot more than the anticipated 2C rise by the end of this century. No wonder Mann et all found this evidence inconvenient and went to great lengths to re write history of that period. The globe image showing the size of Greenland relative to the northern hemisphere is revealing. Even a significant amount of melting of the ice-cap on Greenland just doesn’t seem as scary as the AGW proponents would have us believegiven those scales. Add on the southern hemisphere and the area of Greenland, and its ice, diminishes to insignificance. You cannot deduce that the water was deeper then. Scotland and northern England have been rising since the end of the last ice age but southeast England has been sinking. I just wanted to complement you on the excellent discussion that occurs on this site. It is one of the few blogs I read that has comments that I also read. The comments are interesting and add greatly to my understanding of the post. I never notice trolls here, so thank you for that. Decades ago I wanted to be a geophysicist, but was told that was not a job for girls so I never pursued it. However, my interest in science never waned. I now teach high school government and economics, so this site is an important source for my public policy discussions. I often refer my students to your posts for required reading. Keep up the good work. For example, York. It must have been at the head of a decent estuary when it had its second flowering. Today tidal waters are a bit downstream. It will be interesting to see if it is a summer only reconstruction. If that’s the case the 4C decrease may not be that great on an annual basis. Summer temps are worse than winter temps for reconstructing an annual figure. The other thing people need to be aware of is polar amplification. 7000 thermometers around the planet are not adequate to capture an average. The study clearly shows that cold is far more disruptive for settlements than warmth. That’s why the heck they came then left Greenland in the first place. Global warming is good, cold is a killer. Thank you for the link to this paper Dr. Svalgaard. Very much appreciated. What the link that Dr. Svalgaard provided shows is that we are missing something in the climate models. The trillion dollar question is……….just what in the heck is it???????? I wish the fixation on co2 would diminish enough to allow scientists to think outside the box to find that missing item. Maybe it is GCR…..I don’t know. But somewhere in ole Sol there is a missing link. Leif, the estimated change in TSI in the paper you cite is only 0.9 W m-2 from the Maunder Minimum until present. I actually think it is only half that, at most. Nah, it was the twin Evinrudes on the longboats. Vroom vroom! Funny you mention that. I always thought they went in for the pillage and plunder thing. Maybe it is far worse than we thought. It is not fluctiations in the heat output from the sun that is under study, but fluctiations in the magnetic forces between sun and earth. It is not fluctiations in the heat output from the sun that is under study, but fluctuations in the magnetic forces between sun and earth. The latter are a million times less enrgetic than the former, so are of little consequence. The Black Death pandemic around 1350 may also have played a role in the settlements demise. To make it more interesting, consider the sea level was 2 m higher than today, possibly more, about 3000 to 4000 years ago. There are studies of settlements on the Texas coast that support this idea. There is also some evidence of ports left high and dry in India from about the same period. The usual counter argument for North America is the gradual rise of the land following the Ice Age. The weight of ice removed allowed the land to rebound to high levation. However, this phenomenon is evident farther north around Maine, where ice actually once sat. Thus, the sea level was higher in the past after the end of the Ice Age than it is now. And CO2 did whatever it did. Yngvar, correct, though perhaps not in the way you were thinking. The Black Death left a lot of abandoned farms in Iceland as the growing season was getting shorter in Greenland, and the Greenlendings had kinship inheritance rights to those farms, and many simply moved back to Iceland. If they were pulled by horses, yes they did. Just think, my (4×4) Land Rover has a driven wheel at each corner. A horse has a driven leg at each corner. Admittedly the Landie is more than one horsepower, but the analogy is sound, I think. They seem to be remarkably uninformed about the archaeological and historical data about the norse on greenland. Stable isotope data show that the norse shifted from mainly relying on livestock (not agriculture) to mainly living on maritime food (probably mostly seals) as climate deteriorated. There is no archaeological and very little historical evidence for violence between the norse and the inuits. Icelandic historic sources mention one single clash and inuit oral traditions one or two others. It is true that it is last mentioned in icelandic sources in 1406 (when a wedding in Herjolfsnes chuch is mentioned), but archaeological excavations at Herjolfsnes churchyard shows that it was in use until at least 1450. Historical sources (Konungs Skuggsjá) mention that barley could (just barely) be grown in the Eastern Settlement in the 1200’s. This is not possible under current conditions. The reason the Dorset people left (southern) Greenland was probably that it got too warm (Roman Warm Period, anybody?). The Dorsets did not have any kayaks but were dependent on hunting from the ice in winter. Southwestern Greenland does not have any reliable winter ice under current or equivalent climatic conditions. Isléndingabok (ca 1130) mentions that there were no people at all in SW Greenland when the Norse arrived, but traces of former settlement, and that the norse later recognized that these had been built by the people they came to call “Skraelings” when they encountered them further north and west. The Dorset did survive until much later in northern Greenland and the Parry Archipelago that are much colder than southern Greenland. A small remnant (the Sadlermiut) actually survived in the northern Hudson Bay area until wiperd out by an epidemic around 1900. Somewhat lather the Thule inuits (ancestors of the modern inuit) arrived in northern Greenland from the west (Aleaska). These were maritime hunters relying on hunting from kayaks and took advantage of open water in the Parry archipelago and around Northern Greenland during the MWP. They mostly displaced the Dorset (which they called Tuniit). As the LIA progressed the Thule inuits were gradually forced south as sea-ice expanded, and the original settlements in northern and eastern Greenland ultimately went extinct. The LIA impacted both norse and inuits. And why would one assume that the current knowledge of the Sun – Earth interaction is the definitive one? It is not fluctiations (fluctuations) in the heat output from the sun that is under study, but fluctuations in the magnetic forces between sun and earth. The latter are a million times less enrgetic (energetic)than the former, so are of little consequence. Dr. Svalgaard is absolutely correct that the magnetic forces are a million times less energetic than the TSI input. My simple curiosity led me to discover that the Arctic magnetic field (an unlikely cause of climate change by itself, but a parallel artefact) is a mirror image (in reverse) of the solar activity. I think I know why; it appears to be a very simple ‘down to earth’ process. So, climates change. Who would have thought it? Certainly not those at the EPA or UK Met. Office. I don’t think link was ever missing, it was obvious for as long as the temperatures were recorded, but it has been ignored by scientists. The more I read, the more mistakes that scientists have created to produce their own findings, hence their own science. Statistical record of temperatures really ain’t science. Considering temperatures cannot predict events. The Cooling and the Black Death are directly linked; such pandemics occur in Cool Eras, contrary to warm-monger propaganda. So the LIA caused both inclement farming weather and the setting for mass death by disease. For those asking about the reconstruction. It’s behind a paywall but you can get an idea of the shape of the temperature reconstruction from Fig S6 B in the Supplimentary Information. The temp reconstructions show a warmer period <2000years ago aswell as in earlier periods. I don't know the copyright issues of posting a screen grab of the actual reconstruction from the paper. Maybe Antony can draw a graph and add it to the post please??? One always build on ‘current knowledge’ [which is never ‘definitive’]. Anything else is just [usually inadmissible] speculation. Unless the experts (in this case the climate ones) ignore the basic ‘down to earth’ processes, and fly off into the ‘stratosphere’ looking for a few gone astray CO2 molecules. Having a basic knowledge of physics and applying it correctly works. Every complex problems have simple, ‘down to earth’, explanations which are wrong. I added the [inverse] cosmic ray flux [brown curve] and the solar cycle modulation extracted from the cosmic ray flux [bottom curves]. It is clear that there [unfortunately] are no correlations with any of these solar parameters with the Greenland temperatures. It is clear that there [unfortunately] are no correlations with any of these solar parameters with the Greenland temperatures. Greenland is not place to look for solar correlations. If the most recent period doesn’t correlate, there is no point looking for correlation in a more distant past. My ‘down to earth’ approach concluded that more than a year ago, despite regular ridicule from the resident expert/s, as number of the past posts on this blog can confirm. Is pseudo-science of the worst kind, so doesn’t need to be commented on. Academic science comes to the same conclusion as the ‘pseudo-science of the worst kind’! Case of an ‘Alice in Wonderland’? Conclusions arrived at by invalid analysis [and undisclosed] and not-understood physics still aren’t any good, no matter what they are compared with. I have a 14 year old who is interested in history, and i would like to know where i can get more info on the inuits and others in greenland, atleast for the last couple of millennia. “In the light of the rapid changes taking place today”. Its unusual and refreshing to see scientists recognising the climate cooling currently underway, and comparing it to similar cooling periods which, like warming periods, have periodically occurred throughout measured history with no help from human influence. They could have extended the inquiry further to speculate how long the current Greenland settlement will continue as climate cools. i.e. at 850 BC. then during 500-800 AD (prior to the MWP). The next one in this sequence is, well, now. There really aren’t any such periodicity, e.g. none at 2320 BC. The Alkenone UK’37 data can be converted to temperature using T=29.4(A37-0.039). P.S. I’m a bit puzzled by the negative sign of the UK’37 data given, because that would correspond to T ~ -20C, which doesn’t not sound reasonable, but, hey, I just present the data. The paper used a different formulae for converting UK37 to T than the one you found it goes T=40.8*UK37+31.8 which put’s the rnage of mid=june to mid=July temperature in the reconstruction at ~20-25oC which looks a little better. I’ll have a go at posting the reconstructions latter if you don’t beat me to it. temperature in the reconstruction at ~20-25oC which looks a little better. I’ll have a go at posting the reconstructions latter if you don’t beat me to it. That looks better, indeed [perhaps a bit high…]. The important thing for me was the relative variation. as long a that is linear with the temperature I’m happy. The point was to point out that there is no solar variation [nor cosmic ray] correlation, cyclical or otherwise in the Greenland data. Come on; have some guts! It was much warmer, but the writer doesn’t want to ruffle feathers. If it was “similar,” then it would be possible to raise cattle and over 100,000 goats and sheep, right now. It isn’t. The current “Warm Period” reduced ice in a valley on the cold east coast, exposing crushed branches of birches and conifers. This originally made headlines, as it seemed to support the idea of “unprecedented” warming. However, when it was pointed out birches and conifers still cannot grow in that area of the east coast, despite recent warming, and therefore the exposed branches are evidence that the MWP was warmer than today, this “news” quietly went away. There are many other examples of scientists needing to tiptoe, concerning the MWP in Greenland, because politicians held the purse-strings, but now it is time to demonstrate guts and speak the truth. The Plague hit the Western Settlement and wiped it out, according to the sagas. Jared Diamond’s book (I have not read) seems to indicate 1) there were forested areas in SW Greeenland and 2) there was no native iron, upon which the settlers were dependent for tools and nails. There was only bushy scrub at best with perhaps a few very modest stands of spindly adventitious alders, birches and poplars, nothing more, and there was meteoritic iron, but a little further north it seems was a main source, the Norse settlers never found it. The Taanit/Tuunit=Dorset connection isn’t proved, but makes sense. The “Thule” Inuit who moved into the former Norse areas also spoke of cannibals on the east coast of Greenland. The saga data about the child hostages the Norse took in North America indicate a somewhat different collection of cultures in the region at the time. The Dorset per se were a sort of more primitive Eskimo culture and had stone houses where they were first discovered. The Saqqaq are fairly unknown but an article in a science publication about 2 years ago had genetic studies of a sample of hair found at an archaeological site in Greenland that might have belonged to a member of the so-called Saqqaq culture and found there were connections with Siberian cultures but probably represented a group that was already in North America and distinct from Aleut/Inuit and other Native Americans. Contrary to popular myth, most Vikings were farmers and very few were pirate raiders. The Greenland settlers brought crops and livestock, apparently sheep and cows did alright initially, pigs never did really well, and eventually Greenlandic cows became pygmies, the smallest cows known to Europeans. Viking farming in Greenland was based upon lessons in soil erosion learned in Iceland, which didn’t really apply, Iceland having lots of fine volcanic soils that tended to wash away, whereas Greenland had a lot of rocks and not much soil to speak of. It is more less proved from what I’ve read over the years that the Greenlanders were forced to rely more and more on seafood and less on crops and livestock. It seems rather obvious that they faced the problem of diminishing returns due to a cooling climate, and weren’t prepared to completely change their lifestyles, so they left and went back to Norway, Iceland, or to the Canadian maritimes, or tried to stick it out and failed. All of the above. There is some papal intrigue involving the sale of the eclesiastical province which wasn’t tithing anymore to Portuguese slavers, and there might have been Dutch and even English expeditions as well, because John Dee had maps of a sort and declared the Queen monarch there or somesuch. A mission to check up on the Western Settlement sent from the Eastern found no survivors and livestock loose and grazing the coastal strip between the settlements. The last church record on file in Iceland of the wedding in Garde at Hvalsey Church I suppose probably isn’t the end of the story there. Most likely a few famine survivors were taken in by the Inuit and given a ration of seal meat, those who weren’t adverse to charity from the skraelings, probably children or young people. Relief from Norway was blocked because of icy seas as well as crises back in Europe: plague, famine, war. A decent place to start for eighth graders would be the Catholic Encyclopedia article available on the internet. The wikipedia article is a bunch of ninth graders arguing the merits of Diamond’s thesis.